^ 1.0 1.1 （英文） Strickland, Jonathan. Famous Steampunk Works. HowStuffWorks. [2008-05-18]. ^ Daniel, Lucy. Defining Moments in Books: The Greatest Books, Writers, Characters, Passages and Events that Shook the Literary World. US: Cassell Illustrated. 2007: 439. ISBN 1-84403-605-7. ^ （英文） Kaplan, Janet. Remedios Varo: Unexpected Journeys. Abbeville Press. 2010. ISBN 0-7892-0627-7. ^ （英文） Grossman, Lev. 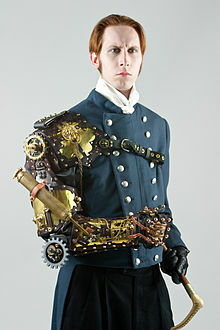 Steampunk: Reclaiming Tech for the Masses. Time. 2009-12-14 [2009-12-10]. ^ 6.0 6.1 6.2 （英文） La Ferla, Ruth. Steampunk Moves Between 2 Worlds. New York Times. 2008-05-08 [2010-11-21]. ^ （英文） Braiker, Brian. Steampunking Technology: A subculture hand-tools today's gadgets with Victorian style. Newsweek. 2007-10-31 [2010-11-21]. ^ （英文） Casey, Eileen. Steampunk Art And Design Exhibits In The Hamptons. Hamptons Online. 2008-08-01 [2012-03-06]. ^ （英文） Rauchfuss, Marcus. 蒸汽龐克美學. 2008-07-01 [2010-02-09]. ^ （英文） Rowe, Andrew Ross. What Is Steampunk? A Subculture Infiltrating Films, Music, Fashion, More. MTV. 2008-09-29 [2008-10-14].